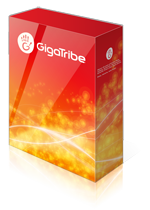 Download Gigatribe private peer to peer software for free! Please uninstall v2.52 before downloading the latest version. Upgrading won't modify your license nor your contact list. When launching version 3 for the first time, make sure you connect with your existing username and password. Do not create a new username and password. Downloading GigaTribe does not give you license to obtain or share unauthorized or copyrighted materials. Do not download this program if you intend to use it for copyright infringement.